A growing interest in the smart grid and smart metering, which can enable the smart grid, has emerged in Japan since the Great East Japan Earthquake and ensuing nuclear power plant accident in Fukushima. The current situation is analyzed, and the author offers his insights. The reaction to smart metering and the smart grid by the Japanese government and electric power industry can be approached by division into three separate phases. The following opinions comprised the large majority. The term “smart grid” creates a lot of buzz internationally, but Japan has the world’s highest quality of electric power, and its transmission and distribution grids are already automated. Thus, the smart grid is unnecessary, or rather, the grid in Japan is already “smart.” Reserve power generating capacity is sufficient; therefore, demand response (mechanisms to suppress power demand, abbreviated as DR), which has gained considerable notice in the U.S., is also unnecessary. Smart meter introduction in the near term will be difficult to achieve, furthermore, when the employment issue of meter readers is considered and communication costs of metered results are taken into account in a scenario where meter readers do not visit each location and take readings. On particular days like holidays when power demand drops, nuclear power generation as the base source of power (steady power supply of consistent amount of electricity) handles nearly all demand. To this base, if the mega solar target is achieved, whereby photovoltaic power generation (PV) of 28 million kW is introduced by 2020 as set forth by the government, then on particular days the PV electricity generated at each home cannot be used up within the residential customer base. Reverse current flow (upstream toward the grid from the home) can occur, and may impose an adverse impact to the power grid. Thus, some sort of countermeasure is necessary as a “Japanese Smart Grid”. A shift in thinking took place to consider the need to control the PV side in a way to prevent massive reverse current flow as PV installations increase, instead of the reduction in nuclear power generation facilities that constitute the base source of power. The Ministry of Economy, Trade and Industry, along with the Smart Meter Program Investigation Committee comprising the private sector and the research community studied the specifications. A consensus was reached in regard to limiting the features to the transmission of 30-minute readings (retention of measurements every 30 minutes for electricity used and batch transmission of the measurement values to a data center) and remote activation and shut-off (starting and stopping the supply of power through commands sent to the smart meter from the data center without an operator travelling to the site). The DR function and studying the interface for the HEMS (Home Energy Management System) were left for future discussion. With reserve power generation capacity no longer sufficient, the early introduction of smart meters has gained strong interest for not just simply visualization of power usage data, but also as a tool to achieve DR that can contribute to peak demand reduction by linking to energy management systems of buildings and homes (BEMS and HEMS). As described above, the stage has been set to promote smart metering and the smart grid in Japan. Thus far, the following events have marked the movement toward implementation. July 2011: Stabilization measures for current energy demand and supply were decided by the Energy and Environment Council of the National Policy Unit, and the following policies were announced: encouraging the introduction of smart meters, dissemination of tariff plans that stimulate peak-time usage cutbacks through the activation of smart meters, and deployment of smart meters within the next five years for 80% of customers including high voltage for an early attainment of the smart grid. November 2011: The Energy and Environment Council announced policies to complete standardization of the interface necessary for communication linking the smart meter and HEMS by the fiscal-year end, and to promote the introduction of HEMS. Consequently, the HEMS Task Force and Smart Meter Task Force were established within the Smart House Study Group of Japan Smart Community Alliance (JSCA, organization established in April 2010 to promote smart communities under joint public and private effort). The task forces studied the standardization of the interface between the smart meter and HEMS, and decided to recommend ECHONET-Lite in February this year as the interface between the HEMS,and connected equipment including a smart meter. A committee of opinion leaders was established to review the electricity tariff program and its operation. The opinion leaders’ committee report concerning the review of the electricity tariff program and its operation was compiled in March this year. The report recommended work to establish standards for the early introduction of smart meters, and an open process to enable actually competitive bidding from the perspective of efficient procurement. In step with the foregoing, as part of its procurement reform for the full-scale introduction of smart meters, TEPCO issued a press release outlining its intentions to optimize specifications by publicly requesting for input on the current specifications and reflecting those domestic and international opinions respectively received for the instrumentation and telecommunication modules of the smart meter. Solicitation of opinions concerning the basic specifications of the smart meter’s telecommunication features started on March 21. The following requirements must be met as the premise for a practical smart meter implementation. The extent of the basic specifications for the smart meter’s telecommunication features shows that TEPCO is not considering automatic DR (mechanism of automatically suppressing power usage of customers by sending a DR signal from the power company when power demand is tight on the grid), which is becoming a basic feature for DR overseas. Previously, TEPCO announced its smart meter introduction plan at the end of February. The plan calls for replacing conventional meters mainly for residential customers beginning in autumn next year, and completing introduction to all 27 million customers by Fiscal 2022, including large offices and manufacturing plants. Thus far, we have seen the changes in the approach to smart meters and smart grids in Japan, and how the specific implementations may occur going forward. TEPCO wants to hold the purchase price of a smart meter at or below 10,000 yen with open specifications for the instrumentation and the telecommunications modules and competitive bidding. Even then, 27 million customers with smart meters would cost 270 billion yen. In addition, the telecommunications network infrastructure cost is said to be at least 100 billion yen for the transfer of meter data between the smart meters and its data center. Moreover, effective usage of the installed smart meters will require not only an upgrade to the meter reading system, but the tariff calculation system, outage control system, customer service system, etc. A rough estimate of the system modification expenses looks like 400 billion yen over eight years. But questions arise over the expectations of fruitful results versus an average annual investment of 50 billion over this time period. In the supply of electric power, reducing the load rate is necessary to suppress peak demand during specific time periods. The measures to accomplish this head in two directions, indirect load control and direct load control. When the power company provides incentivizing information about tariffs and usage, the resulting voluntary suppression of electricity use on the part of the customer is called indirect load control. In contrast, direct load control efforts are in play where the power company directly and remotely operates the electrical equipment of the customer. DR is most advanced in the United States, where FERC compiled a DR assessment（2010 Assessment of Demand Response and Advanced Metering Staff Report）in 2010. 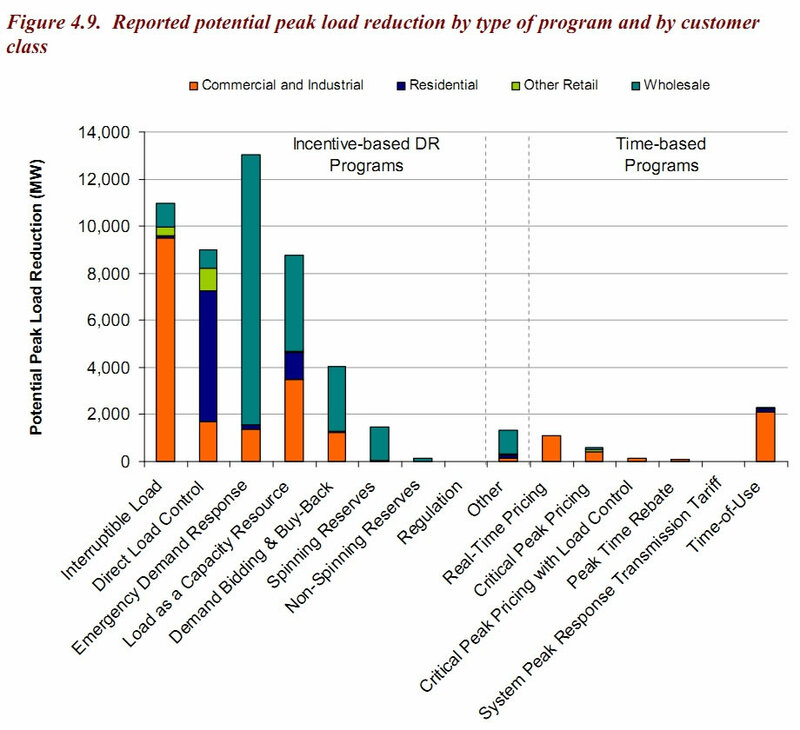 The graph with the title “Reported potential peak load reduction by type of program and by customer class” (Fig. 4.9, p. 33) is reproduced below. Direct Load Control (DLC) on the left side of the graph identified under Incentive-based DR Programs is expected to contribute more to peak demand reduction for Residential customers (dark blue) than Time-of-Use (TOU) and advance-notice Critical Peak Pricing (CPP) on the right side identified under Time-based Programs. In addition, DR programs of Commercial and Industrial customers (orange) are considered to have a greater peak reduction effect. 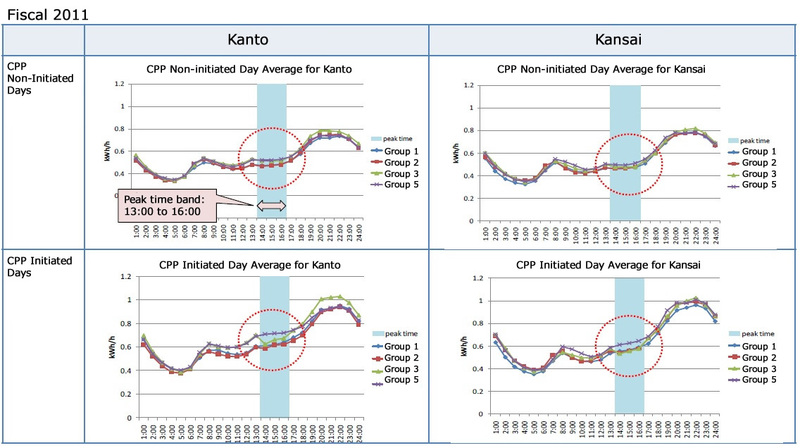 A demand response validation test was held last year among a total 900 homes in the Kanto and Kansai areas in Japan. The following figure presents those results, which show that dramatic peak-demand reduction has not been obtained. The author has no intention of throwing a wet blanket on the enthusiasm over the introduction of smart meters , but, would like to suggest the full-scale smart meter introduction be carry out after conducting further validation tests; take steps to devise the selecting of homes subject to the validation test, dividing the homes into the groups, reconsidering the rates when CPP is initiated, and setting targets for peak demand reduction and checking whether the targets can be actually achieved (whether anticipated demand reduction effectiveness is obtained without an automatic DR mechanism). As part of the third amended budget associated with METI for Fiscal 2011, operational subsidies of 30 billion yen for promoting energy management systems (BEMS and HEMS) were authorized in November last year. If U.S. data was reviewed for reference, however, instead of rushing to introduce smart meters to residential customers, a potentially better direction could be considered that commercial and industrial customers should be 100% fitted first with smart meters, and budget finances concentrated on completing and deploying the peak demand reduction mechanism via automatic DR for those commercial and industrial customers. 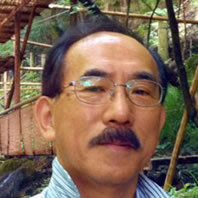 *Takayuki Shintani is an energy researcher and the president of InterTech Research Corporation. Shintani is engaged in research of standardization and the latest technologies mainly concerning the smart grid, including domestic and international trends, and distributing information through his blog.